The official announcement is made on the Google’s blog. In this most I will be highlighting the difference between Google Analytic standard version and the new Premium version. You will find this data useful and handy while talking to your clients/managers/team. 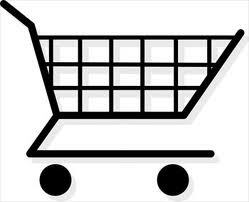 As per the article in Press Trust of India, e-commerce in India has not yet taken off in as big a way as it expected. Rediff Founder and CEO Ajit Balakrishnan said that the low credit card penetration and the high failure rate of debit card transactions is the main reason for low growth of e-commerce in India. Try this out and share your results with us!!! The issue with the RFP’s (request for proposal) is that many other companies will also be bidding for that. This makes you to be more careful while responding to the RFP’s. The best practice is to have very detailed understanding of the requirement. If you have not understood any requirement point, simply pen it down in the form of question to client. Apart from this you should be very much clear about the tool cost, reporting requests etc… to come up with accurate pricing estimates and resource loading data. First, the client is launching the new site or they are not doing web analytics for their current website. Second, they are already doing web analytics for their website and want to outsource the work. 1.Do you already have a license for a web analytics tool or will service partner have to procure it? 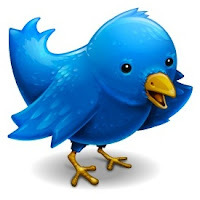 On Tuesday, Twitter launches their free Web Analytics tool. Twitter unveiled Twitter Web Analytics at the TechCrunch Disrupt conference in San Francisco. This tool of Twitter was driven by the acquisition of BackType, which happened in July. The product will provide the following 3 key advantages: 1)How much traffic your website is getting from twitter 2)Clicks/effectiveness of the tweet button on your website 3)Details of how much your website content is being shared across the Twitter network Twitter Web Analytics tool will be available to everyone within few weeks. 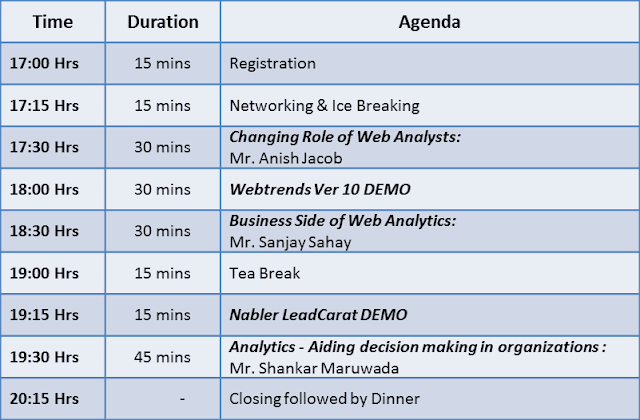 Web Analytics Wednesday Event by Nabler – What a Success! I landed up on the event quite late so missed session by Anish Jaocb. When I entered , Sanjay Sahay, Head-Online Marketing and shared services, Infosys session was going on. I attended the Web analytics meet just to listen to him J. Some of the points he talked about are: 1) Which KPI’s are important for the Business head: · Awareness · Engagement · Pipeline · Loyalty 2) Keep a check on Google Trends. What is the latest trend? 3) He emphasized on to always give reason for hike and drop in the traffic. 4) How the campaigns (internal and external) have affected the above 4 important key performance indicators? 5) What could be the possible call to actions on B2B website?